Day: Sunday, September 10, 2017 NOTE: this event has already happened, find current-year events on the events page. The Melrose NDEW EV Showcase took place at our annual Victorian Fair which guaranteed a good crowd. The event received support from the Massachusetts Sierra Club, Mass Energy Consumer's Alliance Drive Green program, the Melrose Energy Commission, Mayor Dolan's office, National Grid, Quirk Chevrolet, smart Cars of Lynnfield, Melrose DPW, and most importantly, several Melrose EV owners who were enthusiastic about talking to the public about their vehicles. We promoted the event widely in local and social media. If we do it again next year, we'll need to find a larger space to display the vehicles as we had to turn away a few vehicles who hadn't pre-registered due to space limitations. 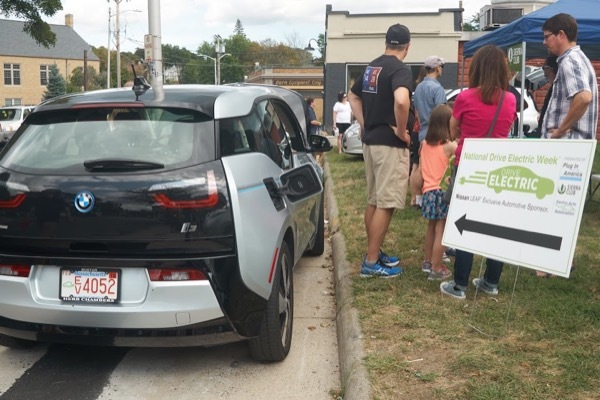 This is one of a dozen electric vehicles on display at the EV Showcase in Melrose, MA on September 10th during their annual Victorian Fair. Join the Melrose Energy Commission in a celebration of the electric car and check out a showcase of electric vehicles at the annual Victorian Fair. Several local EV owners of a Chevy Bolt, Chevy Volt, Tesla, BMW, Ford Focus, and others will be available to share their experience with EV ownership. Learn more about Mass Energy's Drive Green discount program, the MOR-EV Massachusetts electric vehicle rebate, how much fun these cars are to drive, and how easy and inexpensive they are to fuel and maintain. Due to congestion and the large crowd size expected at the Victorian Fair we will not be offering test drives at this event. Look for the National Drive Electric Week booth at the fair on Main Street in front of the Affairs to Remember flower shop at the corner of Upham Street. The EV Showcase will be located around the corner on the lawn of the brick Malden Electric building at 11 Upham Street. Registered attendees report 113,273 electric miles driven.